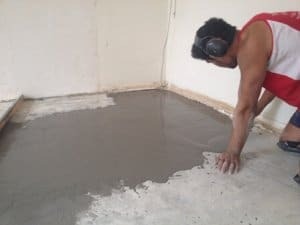 Concrete leveling is the process of using concrete grinders to reduce the size of humps (high spots) in concrete slabs and a levelling compound to fill in the low areas. This is done primarily to prepare the slab for laying floor coverings with minimal tolerances. New concrete slabs are laid to Australian standards which specify 10mm maximum tolerance within any room and 20mm maximum tolerance over entire building footprint. Why do I need leveling? Many concrete slabs have a variance of height exceeding the maximum recommended tolerance for laying timber, laminates, vinyls and porcelain tiles. If this is the case, you will need leveling to prepare your slab. Floating, direct stick and parquetry timber floors generally have a tolerance of 3mm over 3m. Anything outside this tolerance will need leveling to ensure a successful installation, otherwise your timber flooring will have a bouncing effect when laid over high spots and a hollow sound when laid over low spots in existing concrete. Many new developments have slabs poured to carpet spec. The acceptable tolerance for carpet installation is between 8 – 12mm over 3m. This is not suitable for timber, vinyl and larger porcelain tile installation and leveling will need to take place before they can be laid. While there is no specific slab specification or industry standard for laying tiles, there are things to take into consideration when choosing your tiles. The larger the tile, the more level your slab has to be. Rectified tiles (cut after the firing process) have a precise 90 degree angled edge which allows for small grout lines. These tiles need a level slab before installation. Once again there is no specific slab specification for laying vinyl flooring. Vinyl flooring can be laid on any smooth clean concrete slab, however, the finish is a lot more professional and aesthetically pleasing if the slab is level. Large open areas and doorways in particular show humps and low areas in the slab. All slabs need a feather coat prior to laying vinyl to ensure surface is smooth. A feather coat is a thin layer of leveling compound 1-2mm thick troweled over the entire floor to ensure a smooth finish.